Do you know fruit juice is very good for preventing wrinkles? Pineapple juice, apple juice and lemon juice are all great cures when applied to skin. Make a mixture of a tablespoon each of freshly extracted juice of all three, apply in your face and leave it for 10 to 15 minutes and rinse it thoroughly. This will keep your face glowing. One of the major healthy compounds that can be found in tomatoes is lycopene. In the recent studies on the phytonutrients presence in the fruits and vegetables, found that lycopene in tomatoes plays an important role to make this vegetable an extremely good food for the health. Lycopene, along with the other important nutrients in tomato, makes it a super food for health. The list of Tomatoes Nutrition and Health Benefits of Tomatoes is really impressive. This highly nutritious vegetable should be the part of our daily diet. 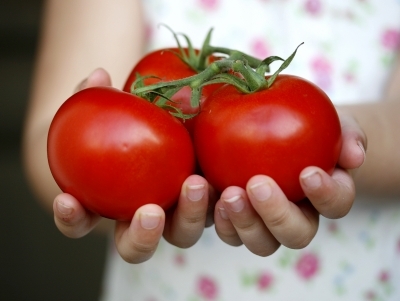 Read on to know about the lycopene and health benefits of lycopene in tomatoes. Lycopene is a carotenoid which is responsible for the red or reddish color in the fruits and vegetables. This phytochemical or carotenoid pigment is known as a powerful antioxidant. One thing must be noted that although lycopene is a carotenoid or chemically a carotene but it does not possess any Vitamin A activity or pro-Vitamin A activity. This same carotenoid can also be found in Watermelons, Carrots, Pink grapefruits and guavas. Lycopene is a naturally occurring plant chemical known as the powerhouse of antioxidants, can be found in high amounts in the tomatoes. Not only that this carotenoid can be found in tomato products such as tomato juice and ketchup etc. Lycopene being a great antioxidant fights free radicals and protects cells from oxidative stress or damage. Oxidative stress can lead to many dangerous diseases but antioxidants in lycopene help to maintain healthy cells. The major health benefits of lycopene are its ability to reduce the chances of cancers and heart diseases. Anti-cancer properties in lycopene protect against certain types of cancers such as colorectal, prostate, breast, endometrial, lung, and pancreatic cancers. Lycopene is very effective in the prevention of prostate cancer in particular. Lycopene is also a heart protective carotenoid. Regular intake of lycopene rich food such as tomatoes or tomato products can reduce the risk of cardiovascular disease significantly. Lycopene boosts the body’s natural antioxidant defences and protects against DNA damages thus promotes the heart health. It also helps to regulate the blood pressure levels. Lycopene plays an important role in the prevention of arteriosclerosis as well. In addition, lycopene carotenoid helps to reduce inflammation of the gums and protects diabetes patients against cardiovascular disease. Lycopene can also be helpful in reducing the risk of macular degenerative disease. Strong anti-oxidant and anti-inflammatory properties of lycopene are very effective in skin care treatment as well. These properties keep the skin healthy, young and free of blemishes. Tomatoes are the best sources of lycopene. Studies found that lycopene is better absorbed by the body if we eat processed tomatoes or tomato products. It happens because lycopene is bound to tomato's cell structure and when we process tomatoes it helps lycopene to come out of the cell structure. So, processing of tomatoes actually releases lycopene from the tomato’s cell structure. Processed tomatoes or tomato products (tomato juice, soup, sauce, and ketchup) contain four times more lycopene than the raw ones. Lycopene is a very essential nutrient for everyone. But people who smoke, eat more processed foods and live a sedentary lifestyle need to eat more lycopene rich foods. Because, all of those including lack of physical activities, are responsible for increased free radical production. When free radical molecules exceed and overwhelm the antioxidant defence mechanism- the oxidative stress occurs. Therefore, by eating more lycopene rich foods like tomatoes, they can protect themselves from free radical damages and eventually from many deadly diseases. 20 Simple Tips to Stay Fit: Quick & Easy!